Greg Koch, Senior Director of Water Stewardship at The Coca-Cola Company. Greg Koch has been working with The Coca-Cola Company across environmental, technical and public affairs issues for more than 20 years. To celebrate World Water Week, he discusses how the company has managed to surpass its target of replenishing 100% of the water it uses – 5 years ahead of schedule. I’m incredibly proud and excited that we’ve reached this fantastic milestone of replenishing 100% of the water we use. We actually reached 115% in 2015, which was way ahead of our target year 2020! 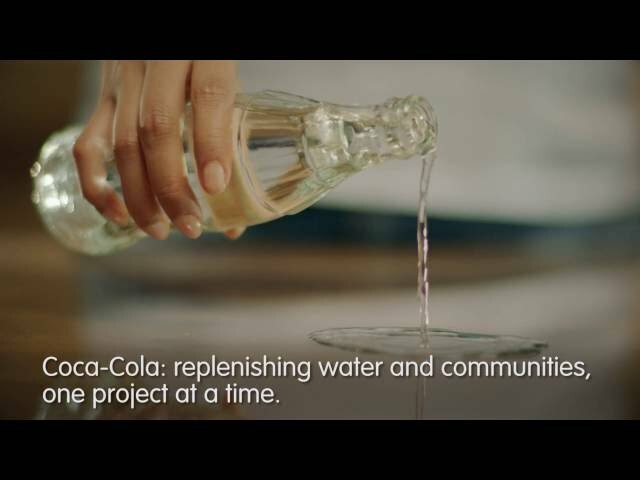 This means The Coca-Cola Company is the first Fortune 500 Company to replenish all of the water it uses globally. But despite this success, we can’t rest on our laurels – there’s still a lot more to do. We set ourselves a goal: to work with our bottling partners and local organisations across governments, charities and the private sector, to replenish the equivalent amount of water that we use back to nature and communities. In other words: for every drop we used, we pledged to give one back. At The Coca-Cola Company, water is the main ingredient in all our drinks. As a global company in more than 200 countries, with consumers enjoying 1.9 billion servings a day, we use close to 300 billion litres of water every year. So we have a duty to source that water responsibly, to use it efficiently and wisely, and then to recycle the water that’s leaving the business in a way that’s not going to harm the environment. A scene from the WaterHealth Centre in Accra, Ghana. WaterHealth provides safe water access to its community. Being a steward means holding something in trust and taking care of it. And that’s really what everyone does with water. Water is a finite resource, but it’s infinitely renewable. And that’s where stewardship becomes very important. You have to say ‘I’ve got to take care of that water, I have to use it efficiently, I have to return the water that’s leaving my business in a way that’s not going to harm the environment, and I need to share that responsibility to protect that water and use it wisely.’ Stewardship is something we all have to do, including here at The Coca-Cola Company. "Our 2020 goal was to replenish 100% of the water we use. But we actually reached that goal at the end of 2015." So as well as taking care of the water we use in our drinks, we promised to give water back to the environment: our 2020 goal was to replenish 100% of the water we use. But we actually reached that goal at the end of 2015 by replenishing 337.78 billion litres of water to nature and communities. Working with a whole host of different charities and conservation organisations, we supported 248 community water partnership projects in 71 countries and over 2,000 communities, which focused on safe water access, watershed protection and water for productive use. In many cases, these projects also provide access to sanitation and education, help improve local livelihoods, assist communities with adapting to climate change, improve water quality, enhance biodiversity, engage on policy and build awareness on water issues. The Belize River in Rio de Janeiro, Brazil. What made this achievement possible was the strong desire from our partners, as well as local communities and governments, to make this happen. You just push a little bit on the door and it flings wide open – and suddenly there are all these projects that you can become a part of. They just need help and support. And that’s what we do. We’re not waiting on a solution. For most water problems, there already is a solution; it doesn’t mean it’s easy or inexpensive, but it’s there. So if you can reach an agreement on who uses what water for what purpose, then you’ve got a great chance of taking on a project that will change things. You just have to be willing to invest and do it sustainably. Put simply: The Coca-Cola Company will not open a factory somewhere and use water where it’s not sustainable. A floodplain reconnection along the Danube river in Romania. We love working with partners like World Wildlife Fund, not just because of the incredible work we can do together on a global scale, but also because they are really passionate about water stewardship, like ourselves. In Great Britain, this is our fourth year in a 6-year partnership with WWF-UK, after working together to replenish 280 million litres of water between 2012 and 2014. We really value this partnership: the 6-year timeframe shows that these aren’t small one-off projects. It reflects the complexity, patience and time needed to implement projects that conserve water on a significant scale. We’re proud of what we’ve achieved, but the work doesn’t stop there. We still have work to do. We’ll keep going, working together with partners and communities to look after the planet’s fresh water, give back and provide long-term solutions. To learn more about our water stewardship programme, read our water stewardship report. Greg Koch is Senior Director of Global Water Stewardship at The Coca-Cola Company. Greg is responsible for leading water stewardship across our global business.